Maxine beneba Clarke | Educate.Empower. It has painted on lights and a bark numberplate that keeps falling off and we have to remake it. 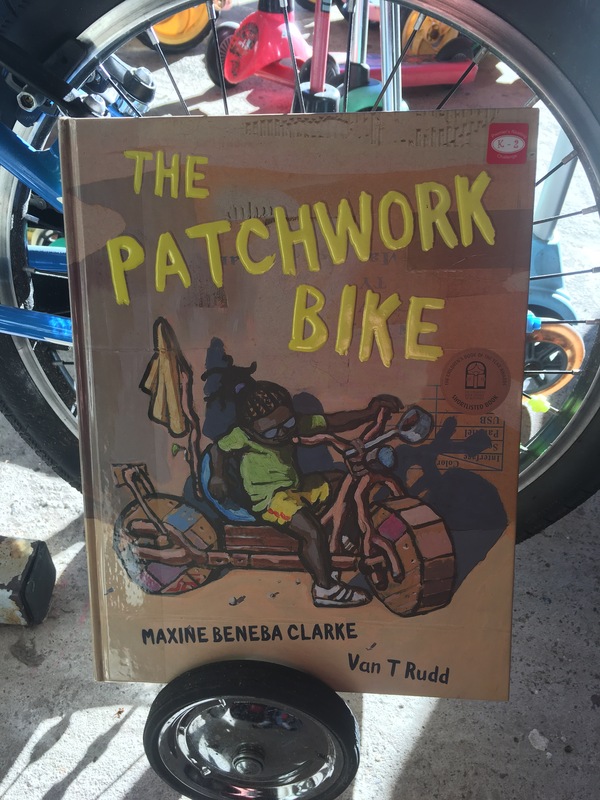 The Patchwork Bike by Maxine Beneba Clarke and Van T Rudd is a fun book filled with onomatopoeia, vibrant adjectives and outside active play. As you read through this story the energy seeps out of the pages as the children tumble through the streets, run up and down hills and zoom along on their homemade bike. Set in a small village on the edge of the No -Go Desert, the children need to make their own fun. The children get inventive and create their own bike made from old bits and pieces (and perhaps some things that mum might need…). They create wheels out of wood, a number plate out of bark and handlebars out of branches. These children use their imagination and problem solving skills to create a bike that can shicketty shake them over sandhills and winketty wonk them through fields. This book is lots of fun to read and really makes you think – that if you didn’t have access to toys, televisions and screen then perhaps more of this would take place in our backyards and parks. Perhaps more children would be outside playing, thinking creatively and using up their extra energy. The Patchwork Bike is a celebration of children and play and the joy of owning a bike. The artwork in this story is superb and more can be seen here. Each page exudes energy, we can see the children playing at all times of the day and all over the village. We can feel the joy and smell the freedom these children have despite the fact they do not have much more. The Patchwork bike is Shortlisted for the 2017 CBCA and I’m thinking it has a good chance of winning! So what can you do to link this to Sustainability? Look at some ‘junk’ you have at home and create a bike, pushcart or scooter! Draw up plans first and then create. What extra things do you need? How will it work? Can any of the toys or things you don’t need anymore go somewhere else apart from the bin? Charity? Garage sale? Repair cafe? A friend? Explore local repair cafes and see how they fix up things that many people think are useless junk. How can you create less waste in your life? Do you really need to latest toy? Can you make do with simple things and still have fun? Try to pick up less free things just because they are free. This especially includes toys that are given as part of store giveaways – you can sign my petition here to stop this.